Do you think of LEGO when you think of poetry? Check out Christian Bök’s poem “The Great Order of the Universe” (shared through The Poetry Foundation). “‘The Great Order of the Universe’ is a response to the fiftieth anniversary of the LEGO patent. 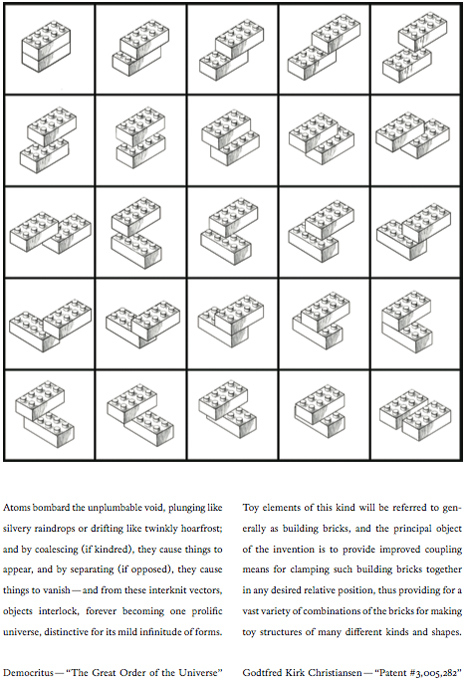 Using a conceptual strategy reminiscent of Sol LeWitt, the image enumerates every possible way of combining two LEGO bricks, each with eight pegs. The caption consists of two texts: the first, a translated paragraph from a volume by Democritus; the second, a transcribed paragraph from the patent by Godtfred Kirk Christiansen. The two paragraphs are perfect anagrams of each other.” (Source: Poetry (July/August 2009)). You won’t think of poetry the same way. Come see Bök perform October 28 at Concordia University (7PM, Hall Building 767).